Rosea and Bianca met briefly at a friend’s bridal shower. On the night of the wedding, their friend Angie introduced the couple formally, while still in her bridal dress. Rosea said, “I didn’t have to do anything, our friend did all the work”. On their first date at a romantic Italian eatery, the two realized they had tons in common, from their goals to their personalities. A month later Bianca officially asked her to be her girlfriend. Together the couple has purchased a house, and after closing on it Rosea proposed to her in front of their family and friends on Labor Day week in 2017. The couple has diverse backgrounds, and mixed heritage, so they knew they wanted to host a destination wedding as a way of celebrating that. The more they looked into it the more an all-inclusive resort felt right. Especially, once they were researching Destify and found they would get a dedicated agent and guests could pay off their trips over time. Their agent Suzy always responded in a timely manner and helped them choose the Dreams La Romana resort in the Dominican Republic. Rosea said, “Suzy was there when I needed her, and she would always give me more details then I needed”. 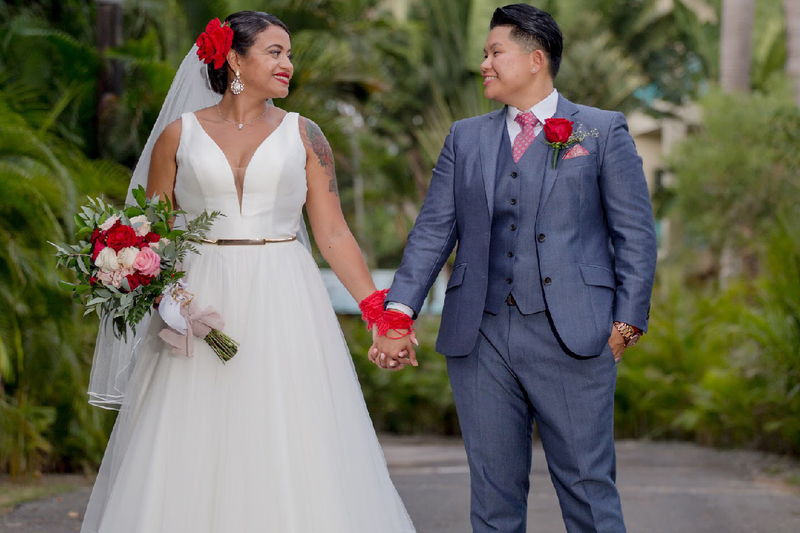 The resort was both family-friendly and LGBT-friendly, which further helped the couple decide on the resort. Once working with the wedding department, the couple cited the Dreams’ staff were phenomenal. They accommodated everything the couple needed, including several extra perks and upgrades at no additional charge to the couple. At the resort their coordinator Jessica went above and beyond to meet all expectations, and to make sure their wedding and reception went perfectly. For the entire stay they experienced great weather, despite hurricane season, with only 5 to 10 minutes of rain for the entire week. The couple stayed in La Romana for 8 days, and they chose to use the trip as their honeymoon too. They were given another room the night before the wedding, so Rosea stayed there while Bianca’s bridesmaids and sister stayed with her. The next morning the couple prepared in their own ways. Bianca got ready with her bridesmaids and mother at the salon while enjoying champagne, and Rosea was busy arranging a special surprise for the wedding and finishing her vows. They held a beach ceremony around 5. After, the guests got to participate in a cocktail hour while the couple took time to take photos along the beachfront. The reception was moved to a private area of the beach, and included everything from delicious food and a DJ, to Rosea’s surprise; fireworks! Many of the guests, along with the couple, utilized their Dominican Republic vacation to the max. They took a snorkeling excursion to Saona Island on a catamaran, and they also booked a fun dune buggy trip. The couple loved that the Dreams’ wedding department was so hands-on, which isn’t always the case with every all-inclusive resort. The trip turned into a large vacation with so many of their loved ones, and they recommend destination weddings as it cuts down on the cost while increasing your opportunities to make extra memories. It even makes your wedding more intimate. A destination wedding is a way to go, I wish we could do it all over again!